Implementation codes of ECCV 2018 paper "Decouple Learning for Parameterized Image Operators"
This is the implementation of ECCV 2018 paper "Decouple Learning for Parameterized Image Operators" by Qingnan Fan, Dongdong Chen et al. One network that implements various visual effects by adaptively changing the network weights with controllable continuous input parameters. 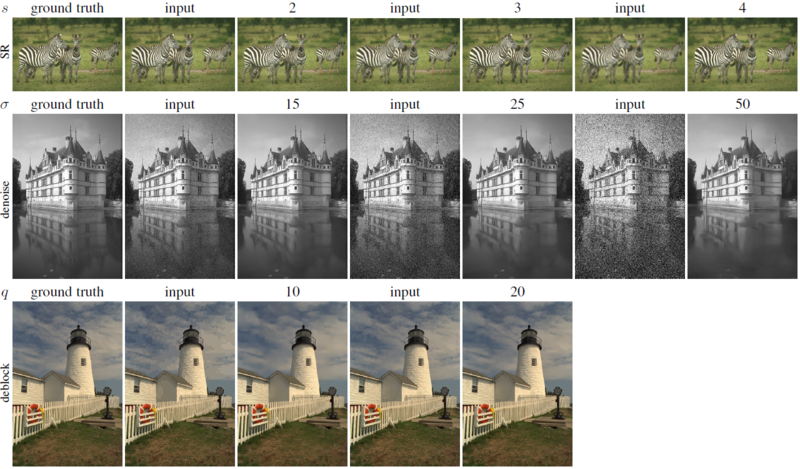 Decouple Learning is a technique that successfully incorporates many different parameterised image operators (edge-preserving filter, texture removal, shock filter, super resolution, denoising, derain, deblock, etc.) into one single network. 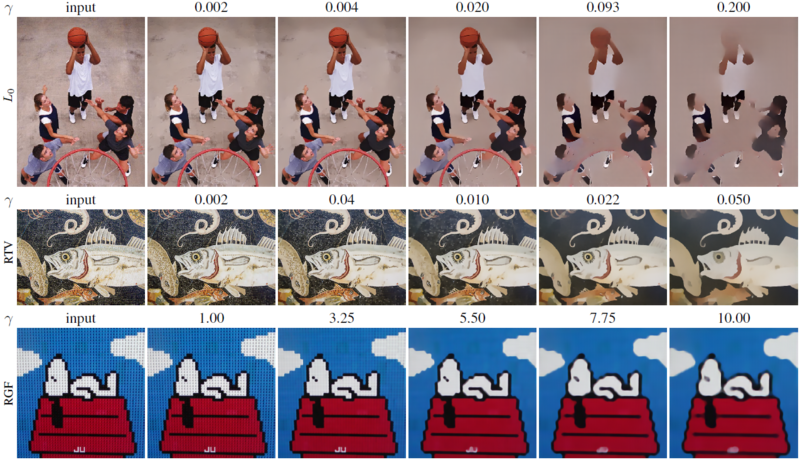 Decouple Learning does not require retraining or finetuning any other networks for different image operators or different parameter settings for a single operator. This paper is implemented with Pytorch framework. Directly run evaluation_10_operator_model.py to test our model on the trained ten image operators with different parameter settings, such as smoothness strength, corruption level of input images. Users can also test our models trained on 6 filtering based operators (evaluation_6_filter_operator_model.py), 4 restoration operators (evaluation_4_restoration_operator_model.py) or each single operator with different parameters (evaluation_1_operator_model.py). Run training_data_generation.m in MATLAB to generate the training or test data for the nine image operators mentioned in the paper, which includes L0 smoothing, RTV, WLS, RGF, WMF, shock filter, super resolution, denoising and deblocking. The training data for the derain task is collected from this paper. The pre-generated evaluation images used in the paper can be downloaded here. The generated training or test images need to be collected into a file list with the same form of example_filelist.txt for easy training. Directly run train_10_operator_model.py to jointly train 10 image operators with different parameter settings. Users can also choose to train our model on the 6 filtering based operators (train_6_filter_operator_model.py), 4 restoration operators (train_4_restoration_operator_model.py) or each single operator (train_1_operator.py). Compute the PSNR and SSIM error metric by running compute_error.m in MATLAB. The ground truth images can be obtained from the above pre-generated evaluation image link. You can use our codes for research purpose only. And please cite our paper when you use our codes.